Guinea pigs make wonderful, interactive pets, but they do require some specific care in order to keep them healthy. With the right diet, housing and maintenance, these small pets can easily live a good five years on average - and sometimes even longer! 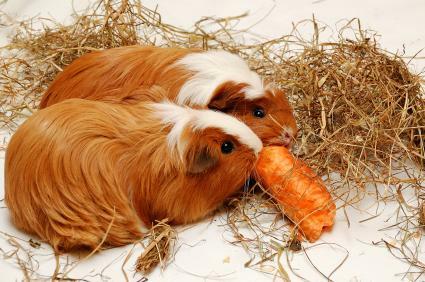 Learning how to take care of a guinea pig for beginners or more advanced pet owners can help keep your pet healthy and happy. Providing your pet Guinea pig with the ideal diet will ensure his good health and a long life with you. Guinea pigs have specific nutritional needs that can lead to significant health problems if not properly met. The most important thing you need to know right from the outset is that guinea pigs cannot synthesize vitamin C. Therefore, they must get it from the foods they eat, or their health will quickly deteriorate. Pet supply stores do sell vitamin C supplements for these animals, and your pet will especially love those C-fortified yogurt drops, but providing the diet outlined below will usually provide adequate vitamin C.
Guinea pig pellets are formulated with vitamin C. Rabbit pellets look virtually the same, but do not contain the added vitamin C. Do not feed your pet rabbit pellets, even though they are considerably cheaper because you'll set your little friend up for a health crisis. Always buy your pellets from the freshest source you can find because vitamin C deteriorates rather quickly, and this reduces the amount your pet will receive from the pellets, regardless of what the package analysis says. As a rule of thumb, avoid purchasing your pet's pellets from a bulk bin where you can't be sure how old the feed is or if it's being rotated properly. All Creatures Animal Hospital (ACAH) recommends limiting an adult guinea pig to two tablespoons of pellets daily. Pellets are most beneficial to young guineas that are still growing, but they generally contain more protein and calcium than the average adult needs. Fresh timothy hay is an excellent source of fiber and nutrients, and it should make up the bulk of your pet's diet. Chewing the long blades of hay also helps keep your pets teeth from overgrowing. ACAH recommends providing an unlimited amount of hay so your pet can eat whatever it wants. Always feed fresh fruits and veggies rather than cooked in order to preserve the vitamin C and make sure you thoroughly wash everything before offering it to your pet. To avoid waste, divide the cup of food into several servings and feed a little throughout the day. According to the Humane Society, a single guinea pig needs at least four square feet of cage space. However, the more space the better. The cage you choose should offer good ventilation because guinea pigs need a lot of fresh air. It should also have a very deep litter pan to prevent your pet from kicking out its bedding. Using a floor with a grate is optional. This type of floor allows the animal's waste to drop through, but it can also damage its feet. Guinea pigs also happen to be hindgut eaters. This means they will eat some of their droppings a second time in order to digest them fully. Therefore, they need some access to them, but you can compromise by covering part of the grate with a rabbit floor mat to provide your pet with a more comfortable place to rest. The cage should also be fully enclosed. Guinea pigs aren't very good climbers, but they do occasionally like to jump just for the joy of it, and it is possible for them to escape if their cage has no lid. A lid also protects the animal from other household pets. You'll need to equip your pet's cage with the following. A water bottle with a gravity-fed drinking tube - This is essential to keep your pet from soiling its water. Mount it on the outside of the cage with the tube inserted through the bars to prevent damage from chewing. An attaching food dish - This dish is equipped with a screw that allows you to anchor the dish to the cage bars so your pet won't knock it over. A hay rack - This hangs from the cage bars, keeps the timothy from getting soiled, and allows your pet to pull out blades of hay as needed. It's extremely important to keep your pet's cage clean. Fumes from excess droppings and urine can make the animal very sick. Scoop out your pet's main soiling area once a day. Most guinea pigs will pick a particular corner that they'll use the most for this purpose. Completely change the bedding once a week. Wipe down the inside of the cage with a 50:50 ratio of white distilled vinegar and water to kill germs and odors. Wipe the surface dry before refilling the bedding and putting your pet back in the cage. Wash the food dish and water bottle tube and nozzle with the same vinegar mix, and rinse and dry them thoroughly before you place them back in the cage. If you're feeding your pet the diet described above and the cage offers adequate room, your pet will get most of the exercise it needs. However, one or two exercise toys can provide some much needed mental stimulation and exercise. A large running wheel or exercise ball gives your pet a chance to work off some extra energy. Short-haired guinea pigs really don't need much brushing, but you can brush them once a week to remove loose hairs. Long-haired specimens need daily brushing and the occasional trim. All guinea pigs can benefit from having their nails trimmed twice a month. Just take off the sharp tips. 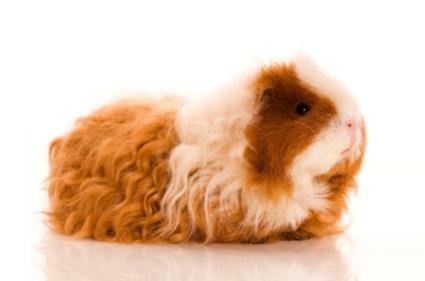 All guinea pigs occasionally need to have their hindquarters bathed to remove crusted droppings or urine buildup, but long-haired specimens will need bathing more often. 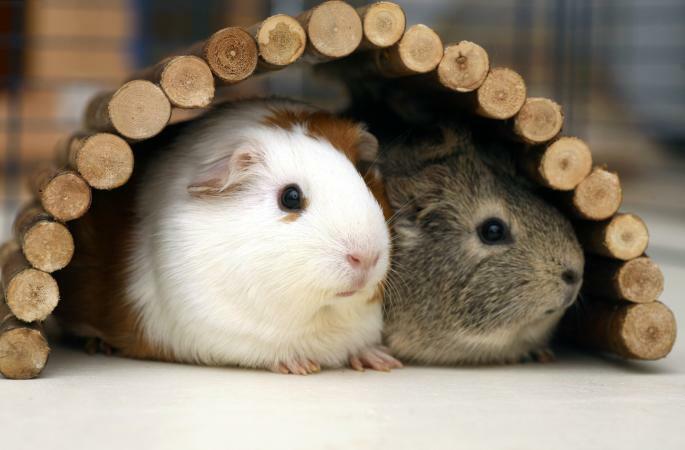 Guinea pigs are very social animals, so you might want to consider keeping two together to prevent loneliness. Just make sure they're the same gender or you could wind up with unwanted litters and a population problem. If you only have room for one pet, try to spend at least 15 minutes interacting with it at several points throughout the day. Depending on your choices and any sales you find, expect to make an initial investment of about $180.00 to purchase your pet and its cage setup. After that, you'll spend about $45 a month on bedding, pellets and hay, plus the cost of fresh fruits and veggies. Veterinary care is rarely needed, but you should seek out a vet that treats rodents and find out the cost of the average office visit. If you feel you have room in your budget to handle these costs plus the time it takes to keep your pet's cage clean, you can provide all the basics your guinea pig will need to have a healthy life.